This article is about the mapping company. For the maps and navigation application it operates, see HERE WeGo. HERE has built its mapping and location business by acquiring location technology and know-how: the company is a combination of what was formerly Navteq and Nokia Maps. Navteq (styled "NAVTEQ"), was an American company founded in 1985 as Karlin & Collins, Inc., later known as Navigation Technologies Corporation and eventually as Navteq. At the time of its acquisition by Nokia, Navteq was the largest maker of automotive grade map data used in car navigation equipment. Nokia Maps began in 2001 as Smart2Go, a generic 3D-map interface for access to tourist information on mobile terminals. It was developed by an EU consortium named TellMaris. Nokia gained the rights to the software when it acquired Berlin-based route planning software company Gate 5 in August 2006, which has become the cornerstone for the company's mapping business. It then made the Smart2Go application free to download. In October 2007, Nokia acquired the Chicago-based company Navteq, which brought 25 years of experience in creating automotive grade map content, and a deep footprint in the automotive industry. Nokia ran Navteq's business along with their own Nokia Maps (later known as Ovi Maps, then again as Nokia Maps from 2011). The two divisions remained as separate entities of Nokia Corporation until Navteq was amalgamated into the core Nokia operations in 2011. The service was rebranded as HERE in 2012, bringing together mapping, location businesses, satellite navigation and other services under one brand. In 2008, Nokia picked up geo social networking site Plazes and the following year it bought mobile applications developer Bit-Side, social location pioneer Plum, and social travel service Dopplr. In 2010, it acquired MetaCarta a leading enterprise local search service used by security and military. In April 2011, Nokia released a beta version of 3D maps that covered 20 cities in the world. By August 2011, the coverage has expanded to 23 cities, and in 2012, Nokia bought EarthMine, which specialises in street level 3D image capture. In May 2011, Ovi Maps was renamed to Nokia Maps when Nokia streamlined its services offering. In October 2011, Maps & Drive for Windows Phone 7 (Mango) was announced, which was available on Nokia Lumia phones (710, 800 and in 2012, the 900). However, major features such as off-line routing and text-to-speech navigation of street names, compared to the Symbian version, were absent. These features were eventually brought over to the Windows Phone platform in 2012. On 13 November 2012, Nokia announced that it would rebrand its location offering as HERE to highlight its vision for the future of location-based services and its belief in the importance of mapping. In June 2014, HERE announced that it had acquired Medio a Seattle-based start-up that specialized in predictive analytics. In 2014, Windows Phone's low market share, as well as the end of Nokia's partnership with Microsoft, led to the company prioritizing Android and iOS development. HERE launched the HERE beta app for Samsung Galaxy smartphones in August 2014. Later in October the app became available on all Android devices running on 4.1 Jelly Bean or higher. The HERE app was re-launched for iOS 8 platform on 11 March 2015. On 3 August 2015, HERE was sold to a consortium of German car makers Audi, BMW, and Mercedes. On 4 December 2015, the consortium completed the acquisition for 2.8 billion euros (2.9 billion US dollars). As of December 2015 the company had 6500 employees. In December 2016, Navinfo, Tencent and GIC Private Limited (the Singapore sovereign wealth fund) agreed to buy a 10% stake in HERE. But in September 2017, the offer of the three companies failed, as US authorities did not authorize the transaction. In January 2017 it was reported that Intel was taking a 15% stake in the firm. In September 2017, HERE and Pioneer Corporation have reached an agreement in which HERE would acquire approximately 3% of Pioneer’s stock at a value of €17.3 million. In parallel, at the same cost, Pioneer would acquire less than 1% of HERE. In January 2018, Continental and Bosch acquired a 5% stake in HERE. In November 2017, HERE announced it would acquire Advanced Telematic Systems for an undisclosed amount. The German consortium together hold a 74% stake in the company. The 2016 Jaguar Cars XF and XJ models incorporate HERE drive guidance in their in-car infotainment systems. All of the features of the HERE suite are available to the driver, including maps, navigation, and social sharing using Glympse. This is all available on either eight, ten or 12.3-inch display screens within the car itself (screen size dependent on model). A hallmark feature of HERE Auto is the ability to plan the journey right from the Android or iOS app before entering the car, and seamless guidance to the final destination after parking the car. What sets HERE Auto apart from competitors such as Android Auto and CarPlay is its nature of being contextually aware, rather than just a screen mirroring solution. Country and region maps are also able to be downloaded directly to the flash-based storage of the HERE Auto system itself, much like the ability to store offline maps on devices using the Android/iOS HERE apps. HERE MapCare was first implemented with Volvo vehicles in 2009, and has since spread to at least 23 other manufacturers (such as Hyundai, Mazda and Mitsubishi) utilising HERE maps data in their infotainment systems. HERE map data is updated for around a period of three years from the date of purchase of the vehicle, and is performed at the time of service from the car dealer. There is also the option of updating maps data via USB memory stick or memory card. Garmin has been using HERE for its mapping system since the days it has been branded as NAVTEQ. With its recent models of Garmin GPS navigation units, HERE has facilitated and used DAB to broadcast live traffic information free to users. This is done through the power cable of the GPS unit acting as an antenna, and provides enough data with low latency, allowing data to be updated in very fast intervals. This is in comparison to data charges stemming from using devices with a SIM card to provide this same level of detailed traffic information. MyFord Mobile from the Ford Motor Company has its location services powered by HERE mapping data, allowing users to find their parked cars remotely from the relevant iOS or Android app. Routes for driving are also able to be planned on the phone itself and sent to the car ready to be enacted. Charging station locations for electric vehicles already inherent in the HERE mapping database are also included in the calculation of routes to be driven. HERE also has a presence at major motor trade shows around the globe. For example, at the Mondial de l'Automobile 2014 show in Paris, HERE had its maps in 50 of the 62 cars on show. HERE also attends other major trade shows such as CES in Las Vegas. In August 2015, HERE introduced a new traffic-jam warning system called Traffic Safety Warning. The system works in alerting the driver with a suitable time period to react to the fact that there is a traffic jam up ahead. Data is updated every minute and is yet another way in which data collected is used to the benefit and safety of drivers. In June 2015, HERE published an interface specification named the Sensor Ingestion Interface Specification. This standard defines how sensor data gathered by vehicles on the road can be sent to the cloud to update maps on the fly. The premise of the technology is to allow for the collection of data to alert other cars on the road to traffic obstacles or accidents in the vicinity. HERE has called for leading car manufacturers from across the world to promote its specification and call for a standardised data format, thereby leading to all consumers receiving the same traffic data reporting. HERE also works in the field of automated vehicles, with the recent provision of its HD Map data for manufacturers in testing their vehicles. The highly accurate mapped data of private test tracks provides these cars with a highly accurate navigation system to complement data collected from on-board sensors. Much like existing map data is collected for consumer driving, the same LiDAR technology is used to map these private test tracks along with the roads that are used for public testing. HD Map data is also highly accurate, with accuracy to a level of 10 to 20 centimetres, and the collection of lane geometry is also part of the data collection task. HERE makes approximately 2.7 million changes to its global map database every day. Also part of the field of autonomous vehicles and automated driving is the Live Roads technology. HERE is currently developing such a technology that will be able to alert drivers of conditions such as weather to alert other drivers of possible hazards, or to avoid a particular area whilst driving. An example is the aggregation of data from windshield wipers and slipping tyres to notify other drivers to avoid an ice-filled area. The company is also investigating Humanised Driving where data is collected on driving habits on roads, and provisioning this data to allow automated cars to follow how drivers behave (speed, traffic lights etc.) when driving on certain roads. HERE has also worked with SWARCO Group [de] (in German) in developing new technologies for intelligent speed guidance. Through the smart provision of traffic lights and management, traffic congestion and vehicle efficiency will be able to be improved. HERE WeGo, formerly Nokia Maps and HERE Maps, is a consumer mapping application that works on smartphones or through a web browser. It is currently available in 196 countries and its features include turn-by-turn walking navigation, offline availability, 3D landmarks and indoor Venue Maps for 100,000+ unique buildings in 87 countries. A favourite's list shows the top 25 most popular places in the vicinity looking at positive reviews, search queries and other user data. The application is also integrated with an augmented reality technology called LiveSight that lets users hold up their phone to reveal information about the buildings including contact information, hours and reviews in their line of sight from the phone camera display. In November 2012, HERE announced the decision to open up its location platform to all operating systems so that anyone with any kind of device could access it. With an open platform HERE broadens its reach and acquires more users, which in turn generates more data for its location cloud. HERE developed a HERE Maps API for Android which is available to partners. Apps built with the HERE Android API will be able to interact with extruded 3D buildings, search for specific buildings and preview their routes in detail. In November 2012, HERE created an HTML5-based web service for iOS. The free app provides iPhone users with maps in almost 200 countries as well as public transit, walking and driving directions. Voice guided navigation is available for walking directions. It also provides multiple map views including a satellite view, public transportation view and live traffic view. HERE Maps on iOS received lukewarm praise mostly because it was a web application and not a native one. HERE Maps for iOS got multiple bad reviews from the start stating it was "a mess", "a wreck", "unfinished", "buggy" and "rushed out HTML5-powered turkey". It was pulled from the App Store in December 2013, after having not been updated for 10 months. The HERE web site was offered as replacement, however as of December 2014, HERE noted that they plan to "officially launch HERE for iOS in early 2015." HERE was re-launched as a true app designed for iOS application on 11 March 2015. HERE makes its location-based assets, such as offline maps, available for the Microsoft Windows platform through a dedicated Windows SDK. Because the suite runs on Windows, users can save their favourite destinations as live tiles to their start screen and the app will calculate routes based on current location. The suite is integrated so that users can access individual functions going from one app to the next without going back to the home screen. Favourites are saved to the cloud so that they can be accessed on all of the different applications. In February 2013, Nokia announced that HERE Maps, HERE Drive and HERE Transit would be available on all Windows devices at the Windows Store. HERE Drive provides navigation designed for in car driving in 94 countries. Its features include visual and audio speed limit warnings, voice guided turn-by-turn navigation with spoken street names (optional) in more than 60 countries in 50 different languages and offline availability. The user interface is designed for drivers and map data includes 260 attributes such as turn restrictions, physical barriers and one-way streets. HERE Drive and HERE Drive+ have optional live traffic information where available, but both lack dynamic rerouting, which is restricted to everyday commuting in a few countries only and then does not come with voice guidance. HERE Transit has public transportation information for more than 700 cities in 50 countries. It combines bus, train, ferry, tram and walking information in one application. HERE City Lens is augmented reality (AR) software that gives dynamic information, through the phone’s camera display, about users' surroundings such as shops, restaurants, and points of interest, shown as virtual signs overlaid on or above buildings. A commercial Beta version was released in 2013. It also has free of charge turn-by-turn voice guided navigation, HERE Drive 3.0 (earlier Nokia Drive), which can also be used without internet connection using preloaded maps. It is also possible to de-clutter the surroundings: version 1.5 has a "Sightline" feature where users can narrow their view to just what is in the direct line of sight, making it easier to spot interesting places. HERE City Lens is powered by Bing Maps, and Nokia introduced HERE Prime Place for listing. The newest release has 3D icons and the ability to disable places which are not within the camera's line of sight. On 15 March 2016, HERE announced that it would discontinue support for its app for Windows 10 Mobile on 29 March 2016 due to its use of "a workaround that will no longer be effective after June 30, 2016", and that the existing Windows Phone 8 app will only receive critical updates after this date and no longer be actively developed. Driving and walking turn-by-turn with international voice guidance. Live traffic rerouting in some countries. Live traffic visualisation on the map in some countries. Third-party content such as ViaMichelin and Lonely Planet. Support for preloading street maps for offline use. Local weather conditions by the hour and forecasts for the week. Satellite maps and terrain maps. 3D buildings and 3D maps. Public transport routing in some cities. City Lens (augmented reality) (Beta only). Nokia stated that the Nokia 808 from 2012, would be the last Symbian phone. Symbian development has halted, therefore no new features for Nokia Maps are to be expected. Accenture is responsible for maintenance of Symbian and Nokia Maps until 2016. Maps for the Series 40 platform (such as early phones from the Nokia Asha series) were limited compared to other platforms. The maps were streamed online into the device or pre-downloaded with Nokia Suite. In some markets, the phones came with a SD card with preloaded local maps. They mostly did not have turn-by-turn navigation, and pedestrian routes were limited to 10 kilometres (6.2 mi) length. As none of the Asha series phones had GPS, positioning was done by Cell ID of the cellular network or by using the Wi-Fi positioning system. An exception was the Nokia 2710 Navigation Edition, which was an S40 phone with GPS and full turn by turn voice navigation. HERE is the default map software on Ubuntu Touch, Sailfish OS, Fire OS and Tizen. It is available on Firefox OS. HERE Map Creator (http://mapcreator.here.com) is a service launched in November 2012 to allow users to update the HERE map. The service is available for more than 100 countries and in 47 languages. It can be accessed from their website mapcreator.here.com and dedicated HERE Map Creator Android and iPhone apps. Users are able to add new roads (trails are included here), edit a road or remove it, add a new place, edit a place or remove it and finally add a house number, edit or remove it. In addition, users can edit road details such as speed limits, number of lanes, 1 or 2 way, type "open road", "tunnel" or "bridge", pavement type, etc. and also add local shops and businesses into various categories such as a grocery store, clothing store, types of restaurants (including cuisine and name of food joint), sports equipment store among several other categories and sub categories. and give various details about them including photos, contact nos., addresses, hours and days of operations in a week, payment info in the shops (whether they accept cash, cards, discount coupons or not). Users can also report map changes. Tutorial videos and instructions to carrying out the editing operations are available on their website. HERE provides mapping data and assistance to many customers in the enterprise sector. One of these services powered by HERE mapping data and geocoding is the FC.frameLOGIC fuel control system by frameLOGIC, which uses fuel probes installed in the vehicle fuel tank to detect discrepancies and ultimately from three to ten percent on their fuel expenditures. Another company making use of HERE data is MapMechanics, whose Truckstops VRS solution engages HERE real-time traffic and historical data patterns to plan ahead and factor in events such as transit strikes, to in turn re-route drivers. Sygic is another truck company that uses HERE map data for its Truck Navigation software, depending on its accuracy and reliability. Other pertinent examples of companies using HERE for their services are Aramex, TimoCom, we-do-IT, Amadeus, Maps4News and Baidu. In July 2015, HERE launched HERE Traffic Analytics, which helps companies to plan for the effects of traffic on projects such as road construction. With the giant silo of data available, HERE has made current and retrospective data available for business customers to be constructed, tailored and extracted to the customers' requirements. Giving such granular control over the data allows for customers to use this data for the purposes they require, and the amount of detail and control needed for projects. The HERE Mobile SDK was launched in February 2014, and in the time since has expanded to add more functionality for developers. There are many customers using HERE mapping data as the backbone for their mobile apps, and the SDK provides access to information such as average road speeds, traffic build-up, and maximum loads that can be transported on a particular road. There have been even more features and access added in each iteration of the SDK, with the latest 3.0 version launching in mid-2015. In the HERE Mobile SDK Starter Edition 3.0, there are native Android and iOS APIs for raster tile map display, online points of interest search, geocoding/reverse geocoding and online pedestrian/car route calculation. HERE Mobile SDK Premium Edition 3.0 extends the functionality to include vector maps, turn-by-turn guidance, truck routing, 3D venue maps and augmented reality. Offline Enterprise Maps (for truck attributes and congestion zones) and LiveSight pedestrian guidance are also provided in this latest version of the SDK. HERE Data Lens is another service launched by HERE whereby customers can visualise their usage of data on a map in a visual form. This pictorial representation provides for extended analysis of datasets and how they are being used. Coverage of street-level views in HERE Maps in 2015. 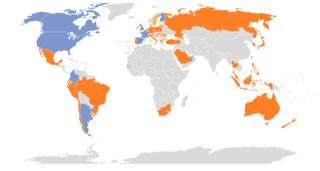 Partial coverage (blue) and "full or partial coverage planned" (orange). HERE draws on more than 80,000 data sources including a vehicle fleet, which collects data through panoramic cameras, position sensors and laser technology for 3D footprints. The cars have an array of cameras, which capture 360-degree street views and LIDAR sensors, which capture 1.3 billion data points every minute. Another bank of high-resolution cameras capture signs such as speed limits and street names. In November 2012, Nokia acquired Berkeley based company Earthmine to further bolster its 3D street level imagery processing capabilities. In addition, HERE relies on local source data and input from map users to generate constant daily map updates, such as real time traffic, turn by turn directions, public transportation routes and information about local business and attractions. By 2013, four out of five cars globally with fully integrated in-dash navigation systems used HERE data. HERE supplies map content for Alpine, BMW, Mercedes, Garmin, Hyundai, Pioneer, Volkswagen and Toyota among other car companies and enterprises. HERE also provides mapping data for popular apps to find and order taxis. Some of these apps are Easy Taxi, MetroView and Grab Taxi. HERE licenses its location platform to other major companies including Amazon, Bing, Yahoo!, Flickr, SAP and Oracle. Each partner uses the HERE location platform, which is available to any business or screen, to optimise experiences for its own users depending on the particular context. Amazon, for example, uses the HERE platform for maps and geocoding, in Amazon Maps. In 2012 the platform computed 11 billion traffic probes a month, 80 million geocoding requests daily, 24 million route requests a day and more than 1 billion search queries in a year. Nokia threatened legal action against a small UK technology firm over its use of the word "Here". Lowdownapp, a digital personal assistant allows users to tell friends they have arrived at a location by pressing the "Here" button. In a letter seen by the BBC, Nokia gave London-based Lowdownapp a deadline of 10 February 2015, to rebrand the "Here" function of the apps. "Our client has invested heavily in building and promoting the HERE brand since launch,". The firm said it had registered trademarks for the word when it related to computer software, such as apps. David Senior, chief executive of Lowdownapp, described the threat as a real-life David versus Goliath. ^ Bonetti, Pino (13 November 2012). "HERE: the next generation of location services". Nokia Conversations Blog. Nokia. Archived from the original on 25 July 2013. Retrieved 18 June 2013. ^ "HERE – the leading offline navigation app – now on iOS". ^ "Nokia Shows Off the Future of Maps With 'HERE'". Mashable. 13 November 2012. Retrieved 18 June 2013. ^ "Nokia's 'HERE' Maps Will Power Microsoft, Facebook, Amazon". TalkingPointsMemo. 15 November 2012. Retrieved 18 June 2013. ^ "Find your way indoors, with HERE". Nokia Conversations Blog. Nokia. 25 June 2013. Archived from the original on 28 June 2013. Retrieved 25 June 2013. ^ Bergen, Mark (21 February 2018). "Nobody Wants to Let Google Win the War for Maps All Over Again - Bloomberg". Bloomberg.com. Retrieved 12 July 2018. ^ a b Reardon, Marguerite. "Nokia to buy Navteq for $8.1 billion". CNET News. Retrieved 6 January 2012. ^ Niccolai, James (1 October 2007). "Nokia buys mapping service for $8.1 billion". InfoWorld. Archived from the original on 8 January 2009. Retrieved 6 January 2012. ^ "Nokia to buy digital map company". BBC News. 1 October 2007. Retrieved 6 January 2012. ^ Erkheikki, Juho (1 October 2007). "Nokia to Buy Navteq for $8.1 Billion, Take on TomTom". Bloomberg. Retrieved 6 January 2012. ^ "Tellmaris: Development of a 3D-map interface for tourist information on mobile computers, 5th FWP, ICT Research, European Commission, June 2001. $3.49EUR million". Europa (web portal). Retrieved 6 January 2012. ^ "Nokia acquires gate5 to add robust mapping and navigation to its devices" (Press release). Nokia. 31 August 2006. Retrieved 20 April 2015. ^ "Nokia Press Release – Nokia Delivers Free Downloadable Maps to the Mobile World". Nokia.com. Retrieved 6 January 2012. ^ "Nokia Press Release – Run on Nokia's mapping and navigation application smart2go" (Press release). Nokia. Retrieved 20 April 2015. ^ "Nokia Frees Smart2Go". 8 February 2007. Retrieved 6 January 2012. ^ "Nokia announce free Maps (smart2go) solution". AllAboutSymbian. 8 February 2007. Retrieved 6 January 2012. ^ "The Inquirer – Nokia to offer free mapping software". 8 February 2007. Archived from the original on 28 May 2008. Retrieved 6 January 2012. ^ "The evolution of Nokia and Ovi". Microsoft Mobile. 16 May 2011. Archived from the original on 31 December 2014. Retrieved 24 November 2012. ^ "Nokia sells HERE maps business to carmakers Audi, BMW and Daimler". CNET. CBS Interactive. 3 August 2015. ^ Rastogi, Ishaan (8 December 2015). "Daimler, BMW, and Audi Acquire Nokia's HERE in $2.78 Billion Deal". NDTV. ^ "Innovating modern map making with Earthmine". Nokia. 13 November 2012. Archived from the original on 17 November 2012. Retrieved 6 December 2012. ^ "Nokia Ovi services renamed, as maps, email and app store get a make-Ovi". CNET UK. 16 May 2011. ^ "A Royal Wedding without Belle and Whistles". IC-Mobile. 2 November 2011. Archived from the original on 7 November 2011. Retrieved 2 November 2011. ^ "Nokia Maps a Course for Its Location Business, Unveils "HERE" Cloud Service". AllThingsD. 13 November 2012. Retrieved 13 November 2013. ^ "Nokia wants to build the Google of human behaviour – and share it". The Register. 27 February 2013. Retrieved 27 February 2013. ^ Etherington, Darrell (13 November 2012). "Nokia Introduces HERE, A Rebranding of Its Maps Service That Goes Head-to-Head With Google". TechCrunch. Retrieved 24 November 2012. ^ "Nokia's HERE Buys Medio Systems To Push More Personalised Location Services". Techcrunch. 12 June 2014. Retrieved 18 December 2015. 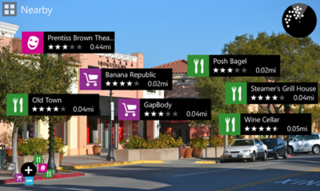 ^ "Nokia's HERE Maps now prioritizing Android and iOS development over Windows Phone - MobileSyrup.com". ^ "Android fans rejoice: HERE for Samsung Galaxy smartphones". HERE Blog 360. 29 August 2014. Retrieved 11 November 2014. ^ "HERE beta version now available for other Android devices". Androidcommunity.com. 21 October 2014. Retrieved 11 November 2014. ^ "Finland's Nokia closes maps unit sale to German car makers". Reuters. ^ a b "Intel to take stake in German mapping firm HERE in automated driving push". Reuters.com. Reuters. 3 January 2017. Retrieved 4 January 2017. ^ "Starting today, it's a new world for HERE... - HERE 360". HERE 360. ^ "NavInfo, Tencent and GIC to invest in HERE; companies to develop location services for Chinese market". Press release by HERE. Retrieved 22 January 2019. ^ "Chinese Bid for Stake in Mapping Firm Denied by U.S. Panel". Road Show by Bloomberg News. Retrieved 8 January 2018. ^ "HERE and Pioneer, forming a new partnership". Road Show by HERE. Retrieved 8 January 2018. ^ "Continental, Bosch help boost HD mapping with HERE acquisitions". Road Show by CNET. Retrieved 5 January 2018. ^ "Digital mapping company HERE to acquire ATS in connected-car play". Reuters. 18 November 2017. Retrieved 28 November 2017. ^ Cremer, Andreas. "Continental, Bosch buy stakes in digital map firm HERE". reuters.com. Retrieved 29 April 2018. ^ "2016 Jaguar XF InControl Touch explained". CarAdvice.com.au. ^ "The new Jaguar XJ debuts with HERE Auto guidance". HERE 360. ^ "Free map updates for your car with HERE MapCare". HERE 360. ^ "All we hear is Radio Garmin: HERE is tuned into DAB". HERE 360. ^ "MyFord Mobile puts the power of electric cars in your hands". HERE 360. ^ "BMW and HERE unveil the future of driving at CES". HERE 360. ^ "Slow down! HERE introduces its Traffic Safety Warning system". HERE 360. ^ "HERE shares how automated cars can 'heal' maps on the fly". HERE 360. ^ "HERE rallies car industry to agree on common data format". HERE 360. ^ "HERE introduces HD maps for highly automated vehicle testing". HERE 360. ^ "Autonomous cars can only understand the real world through a map". HERE 360. ^ "How to humanize the autonomous car". HERE 360. ^ "HERE works with SWARCO on the next generation of traffic lights". HERE 360. ^ Bonetti, Pino (13 November 2012). "LiveSight: immersive experiences you can act on". Nokia Conversations Blog. Nokia. Archived from the original on 14 July 2013. Retrieved 5 July 2013. ^ Bonetti, Pino (13 November 2012). "iOS, Android,". Nokia Conversations Blog. Nokia. Archived from the original on 9 May 2013. Retrieved 5 July 2013. ^ McCracken, Harry (13 November 2012). "Nokia's HERE: Maps, Everywhere". Time Tech. Retrieved 5 July 2013. ^ "Wired Gadgetlab Hands on Nokia HERE Maps App". ^ "Maclife HERE Maps Review". ^ "Afterdawn: Nokia removes HERE Maps App from iOS App Store". ^ Jere Suikkila (10 December 2014). "HERE for Android now available for free on Google Play". Retrieved 12 December 2014. ^ "HERE – the leading offline navigation app – now on iOS". 11 March 2015. ^ Bonetti, Pino (19 February 2013). "Comparing offline capabilities of Nokia Maps and Google Maps". Nokia Conversations Blog. Nokia. Retrieved 5 July 2013. ^ Bonetti, Pino (26 February 2013). "HERE Maps, HERE Drive and HERE Transit for other Windows Phone 8 smartphones". Nokia Conversations Blog. Nokia. Archived from the original on 10 May 2013. Retrieved 5 July 2013. ^ "Nokia's City Lens Hopes to Make Augmented Reality Mainstream". Mashable, Inc. Retrieved 7 September 2012. ^ "Nokia City Lens for Windows Phone". Nokia. Retrieved 16 September 2013. ^ Jon Fingas (20 July 2012). "Nokia Drive 3.0 arrives with My Commute, your Lumia is no excuse for being late". Engadget. AOL Inc. Retrieved 10 September 2012. ^ Infant, Raj. "Getting listed in Nokia City Lens". Retrieved 6 December 2012. ^ "Nokia reveals new City Lens augmented reality app for Windows Phone 8 lineup". Engadget. Retrieved 2 May 2013. ^ "HERE Maps drops support for Windows Phone and Windows 10". The Verge. Retrieved 15 March 2016. ^ Rafe Blandford (6 April 2010). "Custom 3.03 version for Nokia E71 and Nokia E66". Retrieved 20 April 2015. ^ a b "Nokia outsources Symbian support which will continue until 2016". 4 October 2011. Retrieved 18 July 2013. ^ "Nokia Confirms The PureView Was Officially The Last Symbian Phone". Techcrunch. 24 January 2013. Retrieved 18 July 2013. ^ Nokia HERE maps coming to Ubuntu 30 July 2014. Retrieved 19 April 2015. ^ "Watch: HERE Maps for Sailfish OS". The Jolla Blog. ^ Asif S., Nokia announces HERE Maps for Tizen based smartphones and smartwatches Retrieved 19 April 2015. ^ "How fleet managers can combat fuel loss". HERE 360. ^ "Transit strikes affect companies, not just commuters". HERE 360. ^ "Sygic chooses HERE for its Truck Navigation". HERE 360. ^ "How do you deliver packages without an address?". HERE 360. ^ "HERE helps fleets to keep on truckin' without empty runs - HERE 360". HERE 360. ^ "HERE offline maps help field workers get the job done". HERE 360. ^ "Flight attendant: how Amadeus aims to put an end to airline rage". HERE 360. ^ "Maps4News puts HERE maps on the front page of the newspapers". HERE 360. ^ "Baidu and HERE keep Chinese travellers on the map". HERE 360. ^ "Introducing Traffic Analytics for agencies and commerce". HERE 360. ^ "Building blocks for better business apps: HERE Mobile SDK matures". HERE 360. ^ "Try the new HERE Mobile SDK for free". HERE 360. ^ "A map is worth 1000 numbers with HERE Data Lens". HERE 360. ^ Goodwin, Antuan (15 November 2012). "Nokia, Navteq show us how a map is made". CNET. Retrieved 10 July 2013. ^ Bonetti, Pino (13 November 2012). "Innovating modern map making with Earthmine". Microsoft Mobile. Archived from the original on 19 January 2015. Retrieved 20 April 2015. ^ Lomas, Natasha (31 January 2013). "Nokia Chalks Up In-Car Maps Win Against Google, Signs Toyota Motor Europe To Use HERE Local Search". Techcrunch. Retrieved 10 July 2013. ^ "Easy Taxi, MetroView and Grab Taxi use HERE to find you a taxi". HERE 360. ^ Bonetti, Pino (7 November 2012). "Building a global mapping platform". Microsoft Mobile. Archived from the original on 20 April 2015. Retrieved 20 April 2015. ^ Dave Lee (30 January 2015). "Nokia threatens London start-up over 'HERE'". BBC News. Retrieved 31 January 2015.